An alarming 1.2 million new cases of skin cancer are diagnosed each year due to people regularly exposing their skin to powerful and damaging UV rays. Do you know that whenever you frequently expose your skin to ultraviolet rays, it causes many complications other than just skin cancer? Some of the problems repeated UV exposure can cause are wrinkles, age spots, hyperpigmentation and leathery skin. Made In The Shade: During peak sunlight hours, from 10am to 4pm, stay out of the sun. If you can’t find a shady area, limit your sun exposure as much as possible or just stay indoors. Take Cover: Wearing long sleeved shirts, long skirts and pants are smart ways to shield your skin from the sun. You can protect your eyes by wearing sunglasses that are UV-resistant as well as wearing sun visors. Protect your scalp by using wide brimmed hats whenever you’re outside. Be sure to protect your skin on overcast days as well. Don’t Feel The Burn: Approximately 2.1 percent of men and women will be diagnosed with melanoma during their lifetime - and each sunburn a person gets increases this risk. 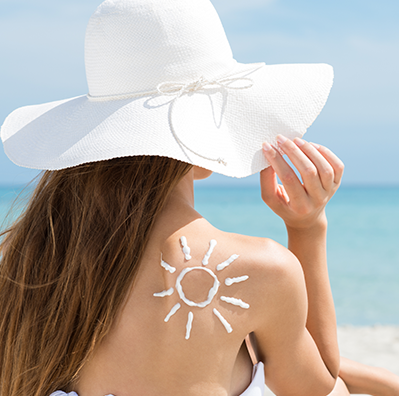 Using a Broad Spectrum Sunscreen with an SPF of 15 or higher every time you’re outdoors can help you avoid sunburns as well as prevent irreversible damage to your skin. A Reflection On You: The sun’s harmful rays can be reflected (and amplified) by water, sand and even large windows. This can increase your risk of sunburn, even if you’re in a shaded area. Practicing preventative outdoor skin care year-round is a smart and healthy thing to do to protect your skin from harmful UV rays. Stop by Woodlands Wellness to find out more information about UV skin protection.